This is not the first time 26-year-old Vangelis “Angelo” Kapatos has attempted to commit suicide. Facing eviction from his family’s rent-controlled apartment in New York City, with his mother back home in Greece and his father in a nursing home with paralysis and cancer, he’s got plenty of reasons to be distressed. After his landlord started eviction proceedings against him and fresh out of Bellevue Hospital, Angelo tried a variety of suicide attempts, including hanging himself in the apartment, cutting his own throat, and finally, jumping to his death (or so he thought). 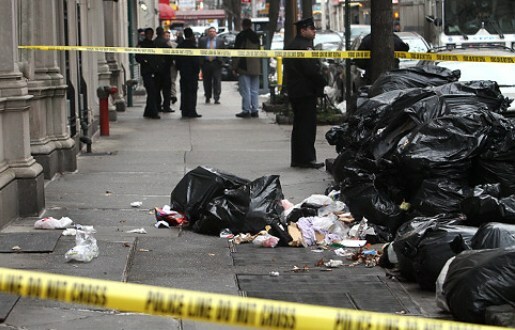 Vangelis “Angelo” Kapatos jumped out of the window of the family apartment, falling nine stories into a pile of garbage bags that broke his fall and saved his life. Granted, it was only 9 stories, but smaller falls can kill you. To jump out of a window that high up (or higher) and survive is incredible. Even more incredible is the fact that Angelo’s life was saved by stuff he’d been throwing out the week before. The thing that saved Angelo’s life is the fact that the city sanitation department is inept and corrupt. The city suspended garbage pickup on December 26 in the wake of the blizzard; the build-up of garbage bags is what cushioned Angelo’s fall. The day before the jump, workers in his building took out the trash and piled it up on the curb. That layer of rotted junk is what broke his fall and kept him from splattering all over the concrete.